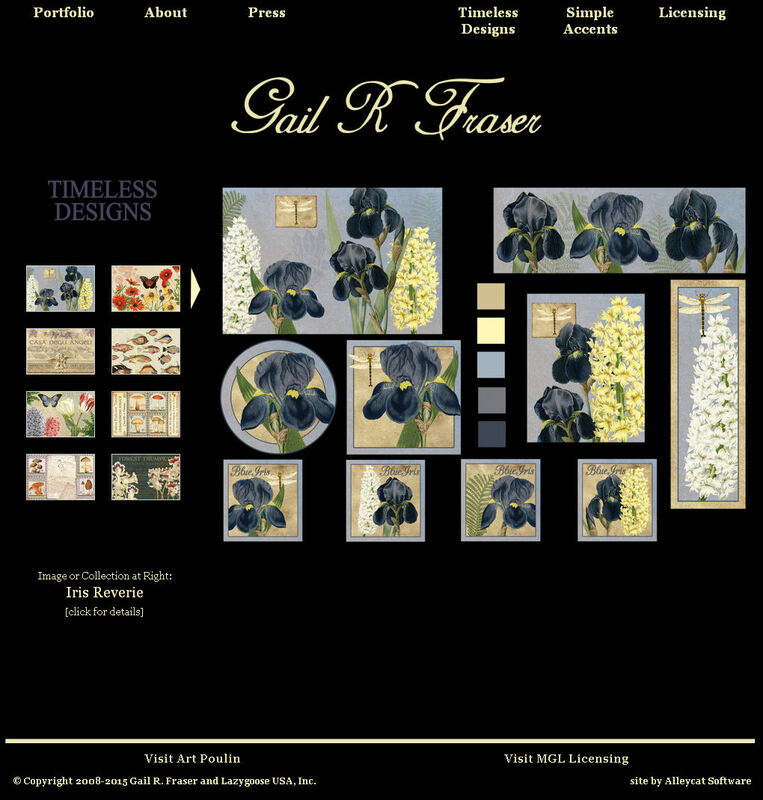 Gail R. Fraser offers the user views of two galleries, available via pulldown menus. Galleries include: Timeless Designs and Simple Accents. 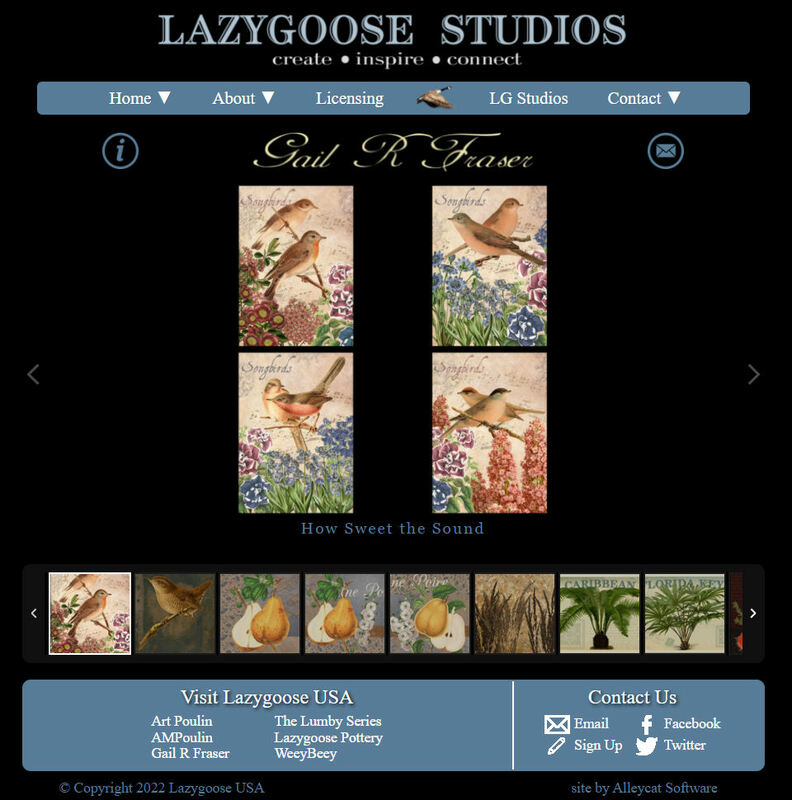 Customized jQuery gallery software presents random thumbnail subsets on all pages, plus full-featured galleries with thumbnails and large size images. Scrollbar customization allows use of scrollbar or arrows to scroll left/right to view samples on the home page. Scrollbar customization allows use of scrollbar or arrows to scroll left/right to view samples on the home page. PHP/mySQL used on the server. jQuery for browser-independent user interaction. Cascading style sheets for consistent formatting. Hand-coded pages for performance and maintenance. All graphic images optimized for performance. No non-standard technologies, such as Flash. Galleriffica tool presents prints and items in smooth scrolling galleries, with image fade-in/out. Several unique customizations to Galleriffica tool makes presentation unique. Easy navigation through galleries using thumbnails and next/previous buttons. Non-gallery pages also include selection of random thumbnails. Data is maintained in file for easy maintenance, and gallery code is built on the fly from the data. Imagemagick scripts perform batch resizing and cropping of gallery images. Random gallery images presented on text pages.